While it’s true that smartphones with cameras have cut into the demand for regular cameras, the market is by no means dead. There is still a thriving demand for cameras of all types, from consumer DSLRs to industry surveillance cameras, high end, cheap, or new brands, the opportunities for finding the right product for your business needs are endless. Large range of products to complement the cameras you need. Buying online usually also means that you can find a large selection of accessories to complement the type of cameras you are looking to buy to resell in your business. For instance, 35mm cameras with flash also need camera film, and you can often save even more if you order these multiple items in bulk. Digital camcorders also need headphones, tripods, carrying bags, storage disks, and spare batteries. Instant Polaroid cameras are making a comeback and will require film and carrying straps. The possibilities are large, you just have to know your target audience behavior and find the right product for their needs. The flexibility in pricing. Perhaps you have a small business in alarm installation, and you require 500 surveillance cameras to get you through the rest of the season. Buying from an online wholesaler lets you enquire about creating custom quantities that may seem too large for retail pricing but often too small for most brick and mortar wholesalers. Alibaba brings wholesale suppliers together, all in one space. From brand name consumer electronics to outdoor surveillance kits, you can find a vast collection of electronic goods in small or large quantities. LightInTheBox specializes in cameras and camera-related products. Sony, Panasonic, Casio, Kodak, Nikon, Samsung - they carry nearly every make and model from nearly every brand. Besides cameras and accessories, they also sell such items as digital picture frames. Liquidation.com you’ll find the whole gamut of consumer electronics, from entire home entertainment systems to iPhone accessories and everything in between here. Bulk lot auctions start at only $100. Genco Marketplace finds consumer electronics at below-wholesale prices to the tune of $3MM daily. How? They resell products from major retailer’s closeout sales and customer returns. High-definition and plasma TVs, home entertainment systems, stereos, gaming systems and, of course, cameras. DHgate.com this is China’s premier B2B wholesale e-commerce website for nearly everything you’ve ever heard of in electronics and then some. 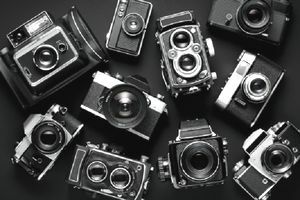 It’s unsurprising that nearly all the major players in the camera wholesale segment are also major players in the broader consumer electronics market. With each of these companies competing against each other, the deciding factor for buyers will probably be the ease of transacting with each one. Before placing a large bulk order with one wholesaler, you might want to try minimum orders with a few different wholesalers to determine which one is the best fit for your own company and customers.